With Philadelphia Arrests, Starbucks Again Becomes Focus Of Cultural Debate Starbucks faces protests after the arrests of two black men last week in one of its locations. From #BlackLivesMatter to refugee resettlement, the coffee chain is no stranger to social causes. Starbucks is mired in controversy after the arrests of two black men last week in one of its Philadelphia locations. But recent history shows the coffee chain is no stranger to cultural conflict. Starbucks has come under intense criticism after a video emerged last week of two black men being arrested inside one of the coffee chain's Philadelphia locations. 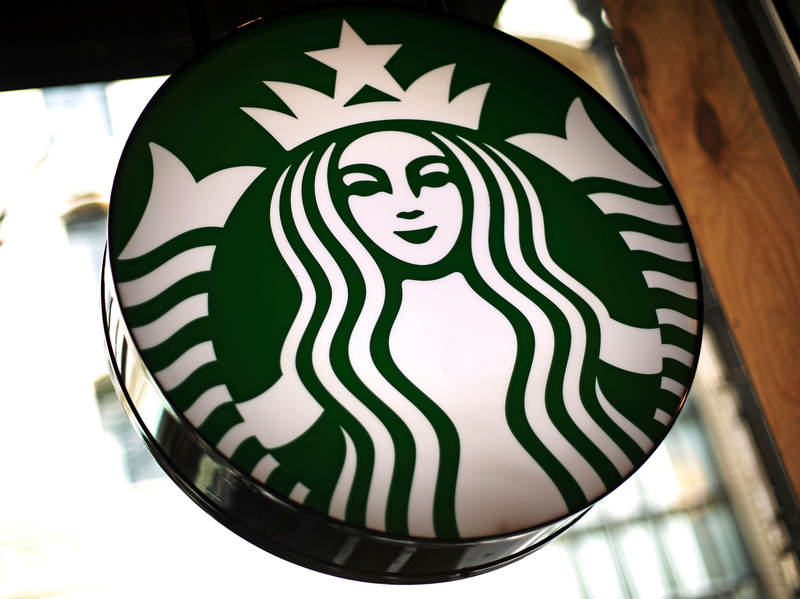 The arrests occurred last Thursday, and by Saturday Starbucks had issued an official apology. On Sunday, as protesters gathered outside the Philadelphia location, Starbucks CEO Kevin Johnson reiterated that apology in a video, calling the incident "nothing but reprehensible" and offering to meet the two men in-person. On Tuesday, the company announced it will temporarily close all of its company-owned locations in the U.S. for the afternoon of May 29. While over 8,000 stores will be closed to the public, Starbucks will be conducting racial-bias training "geared toward preventing discrimination." The training, according to a company press release, will be provided to nearly 175,000 retail and corporate employees. Starbucks says the training also will be offered to new employees, and that it will provide access to the training to its corporate partners and licensee stores. It's a dramatic move for the company, which has faced impassioned calls to "do something" in response to last week's incident. And while Starbucks is no stranger to the spotlight, it usually finds itself on the other side of the debate: pushing progressive policies forward as a champion of social causes. Here are some ways the company has addressed race relations in the past, and how it has managed social backlash. In 2015 Starbucks launched its "Race Together" initiative, where baristas were asked to write "Race Together" on customers' cups in the hopes of initiating discussions on race. This piece from NPR's Code Switch collected reactions to the campaign, which ranged from "unclear," "confusing," and "unfair," to "terrible" and "manipulative." In 2016, customers flipped the script on Starbucks: writing #BLACKLIVESMATTER as their names on mobile and online drink orders, forcing baristas to yell out the slogan when announcing their drinks. The trend was shared tens of thousands of times across social media. It's impossible to know if it sparked more or better discussions than Starbucks's "Race Together" effort. But it did come across as more authentic, more altruistic, and more effective than the company-led campaign. In early 2017, Starbucks waded into the immigration debate when it announced a plan to hire 10,000 refugees worldwide. The move was seen as a response to President Trump's recently implemented travel ban, and came amid Europe's own migrant crisis. Starbucks's plan sparked boycott threats from the political right, and may have impacted the company's brand reputation. Ever-mindful of its own image, the chain reacted by quickly announcing a plan to hire more veterans. In March 2017, in response to boycott threats, Starbucks revealed that it had already met a previously established goal of hiring 10,000 veterans and military spouses. That plan was originally announced back in 2013. Starbucks then upped its target — committing to an additional 15,000 military and military spouse hires by 2025. Before its refugee announcement, and before recommitting to hiring military spouses and veterans, Starbucks pledged in 2016 to hire 10,000 "Opportunity Youth." Company representatives characterized the move as an outreach to the millions of 16- to 24-year-olds across the United States who are unemployed and not in school. The company framed these "young, motivated workers" as an "untapped resource" critical to filling thousands of entry-level positions. If you're starting to see a pattern here, you aren't alone. These hiring initiatives garner massive press attention and make sense for a company with over 250,000 employees worldwide. With thousands of open positions to fill every year, Starbucks is smart to fold in progressive campaigns with its hiring obligations. The crisis Starbucks now faces, though, calls for more than handing out 10,000 green aprons and a crash-course on coffee curation. Last week's incident was a real instance of racial discrimination — it occurred inside a Starbucks store and was captured on video. The arrested men were accused of trespassing simply for asking to use the restroom while waiting on a business associate. As a company that strives to cultivate a warm, inviting atmosphere where people can work and talk, kicking out two black men for asking about the bathroom smacks of hypocrisy and racial profiling. In the coming months, Starbucks will have to grapple with what happened and what the company will do to prevent it from happening again. It's not a problem that can be solved with slick PR and social media monitoring. It's a problem that speaks to the hard, human task of eliminating unconscious bias at an institutional level across a global workforce. Tuesday's announcement takes the brand one step closer to finding a solution. "I own it," CEO Kevin Johnson promised in his apology video, "and I am accountable to ensure we address the policy and the practice and the training that led this outcome." Whether he will live up to that promise remains to be seen.